In a blue post on the EU forums, Vaneras confirmed that the event has been pushed forward by over a week. via Brewfest start date postponed after concerns raised, Chase Hasbrouck, WoW Insider. I’m glad Blizzard decided to respond so quickly to the community’s disappointment. In general, Blizzard’s usually pretty good about listening to its community (when it can). On a personal note, I don’t think this changes anything for Mooglegem or me. Pushing it back a week gives us a week and a half to two weeks to reach level 89. I bet I’ll be 86, maybe 87 by that time. The solution I wanted was Brewfest before Mists of Pandaria. …over the entire 15-day run of Brewfest, Coren will only be accessible for 10 days, and you’ll only have as many tries at him as you can squeeze in once you hit 89, whenever that is. via Brewfest updated for Mists of Pandaria, requires quick leveling, Matthew Rossi. Source: CM Nakatoir on the EU forums. Brewfest begins on September 20 and ends on October 5. Unfortunately, Mists of Pandaria launches on September 25, and Coren Direbrew, the holiday boss, is tuned for level 90. That means you can’t queue for it until you’re 89. Those first five days of Brewfest? He’s inaccessible for those days. Of course, for the remaining 10 days you can only queue for him if you’re level 89 or 90. There are a lot of boring in-game holidays, and Brewfest is not one of them. However, I level slowly. It took me almost six weeks to get from 80 to 85. Something tells me I won’t be fighting Coren Direwbrew this year. This is NOT cool. At the very least, he should be accessible and tuned for level 80 for the first five days, although I’d still be sad that they couldn’t just push the event to a different time. I know I’m in the extreme minority by saying this, but I would even prefer to delay the expansion. I love this event! On the other hand, I already have the Swift Brewfest Ram. I’d like the kodo as well, but the ram is what I really wanted, and I have it. Mooglegem still needs the ram, but I’m fairly certain she has it on her alt (along with the kodo). There’s something I didn’t realize until I read this comment by ladyjbritish on the WoW Insider article. That doesn’t help me with the kodo, but I suppose that means gem doesn’t need Coren Direbrew at all. Still, I wish I could fight him all 15 days! Every week, Blog Azeroth proposes a Shared Topic for World of Warcraft bloggers to discuss. This week’s topic was proposed by frinka of Warcraft Street. Have you ever tried to introduce real life friends to WoW? If yes, how did it go? If you never have, why not? I’ve discussed the game many times with friends who don’t happen to play WoW themselves. I’m going to discuss the question under the assumption that it means introducing it to them with the intent of getting them to play it. When I first reached the level to run Wailing Caverns, I found that WoW suddenly needed a few uninterrupted hours so I could complete the dungeon. While I didn’t mind this, it was annoying for gem because it tied me up for a long time. We talked about her playing a bit but never really decided either way. It’s not that didn’t want to play, but she wasn’t really jumping at the chance either. Then her birthday came, and our friend Antonio bought her the Battlechest. She loved the game, and now I very rarely play without her! Last week’s topic was proposed by frinka. If it were possible, would you want Blizzard to put all characters in a single realm/game world by realm type — PvP vs PvE vs RP? Why or why not? There are two posts I especially liked on this subject. Karegina of Ysera’s Daughter enjoys being able to start anew on a new realm and is against merging to a single realm. Faye of the Dancing Tree begins under the impression that it could bring all the RP together but quickly realizes that it would be too crowded for any actual RP. Faye continues by discussing lag and the lack of familiarity on such a large realm. I’m actually a little sad that Mists of Pandaria has a release date. In just two months on September 25, the game will release. I’m looking forward to it, but at the same time, I guess I’m feeling a bit of anxiety over it. On the positive side, I’m looking forward to raiding and seeing new stories. This is actually kind of odd since I still have tons of zones I haven’t done. I’m also really looking forward to pet battles. I’m not looking forward to changing my UI, unhiding my bars, and learning new spells. Also, I dread not having mana. This post goes back a little more than a week because last week’s Suggested Reading was written in advance. This is also all from WoW Insider, although I swear I caught up on my other WoW blogs! Around Azeroth: Mistaken identity, Elizabeth Wachowski, WoW Insider, 7/10/12. I never expected an Around Azeroth post to make it here, but this is just so cute. 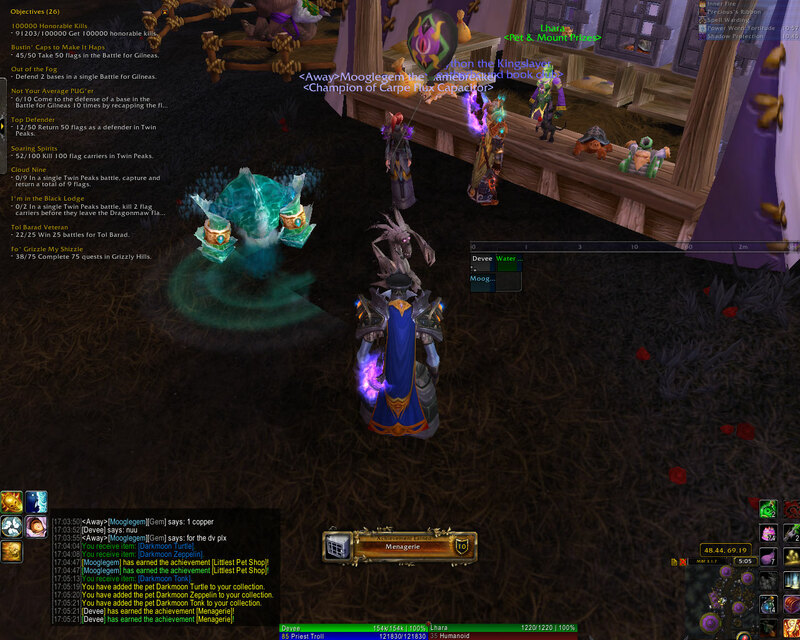 It’s a screenshot of a gnome at the Darkmoon Faire competing with the NPC that ports players back to the cannon. Know Your Lore: The final boss of Mists of Pandaria, Anne Stickney, WoW Insider, 7/15/12. The Old Gods are known to cause destruction and chaos around them. Who’s causing destruction and chaos in the upcoming expansion? We are. WoW Archivist: The evolution of Alterac Valley, Scott Andrews, WoW Insider, 7/13/12. A great look at how Alterac Valley has changed. While they were clearly flaws in the original, and I’m glad I can do AV relatively quickly, this article does make me think that Blizzard’s has gone too far. Reflections on moving from a PvP to a PvE realm, Matt Walsh, WoW Insider, 7/9/12. After moving from a PVP to a PVE server, Matt realized he didn’t have to be afraid out in the world anymore, but it also felt like something was missing. Team Matticus takes on the updated Pet Battle system, Matt Low, WoW Insider, 7/17/12. Matt gives a tour of pet battles! Grandpappy Frostheim on dumbing the game down, Brian Wood, WoW Insider, 7/12/12. Is the game really getting easier, or is it just getting more accessible? Grindings not hard; it’s time-consuming. Obsidian Nightwing now available as Recruit-A-Friend mount, Daniel Whitcomb, WoW Insider, 7/16/12. Take a look at the new RAF mount. 48 dailies are 48 dailies too many, Olivia Grace, WoW Insider, 7/18/12. There are up to 48 Mists of Pandaria dailies to do each day, and Olivia Grace thinks that’s 48 too many. With the way World of Warcraft is currently organized, god, no. You would never be able to get anything done. You wouldn’t be able to see anything with all the people, and this if there wasn’t lag, which there would be. However, I do like the idea of having everyone together, unsegregated from their friends. One way to do this is to use the Guild Wars model. There are different “districts,” which are like realms, in the cities. The “world” doesn’t really apply to WoW because GW’s world outside of cities and towns are all instanced, but the cities function like MMOs. You can freely hop between districts to get to your friends. The number of districts grows and shrinks dynamically based on the current server load. When you log into the game, you’re placed into a low population district, but you’re always free to change to any numbered district. This means you can just ask your friend what district they’re using and hop into it. Does World of Warcraft need this? The Real ID system makes this, for the most part, unnecessary. You still can’t trade cross-realm, but at least we can all play together. Last week’s topic was proposed by dragonray. Sadly, I forgot to post a link to mine in the thread. Oh well. Are you starstruck by anyone? Does someone in the community respond to a post or a tweet and get you all speechless because they actually responded? Is there anyone you are waiting to have respond directly to you? Is there someone that you would like to chat to, but are too chicken? Am I the only one who puts other bloggers on a pedestal? Evlyxx’s post on Evangelysm about Malevica of Type “H” For Heals. While working on the Darkmoon Faire last week, I purchased that ugly mount along with three pets – Darkmoon Turtle, Darkmoon Zeppelin, and Darkmoon Tonk. In doing so, I earned Menagerie! Of course, if you look closely at the chat window in the screenshot, you’ll see that Moogle had to show me up!